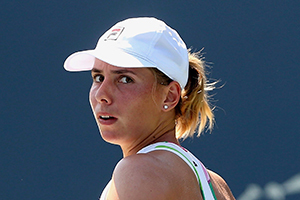 Marina Erakovic is a former World No.39 and Players' Council stalwart with 9 Women's Tennis Association Title and 18 International Tennis Foundation Titles to her name. Marina has recently retired from professional tennis and is currently pursuing an Economics Major at the University of Auckland. Sport: As New Zealand's no. 1 women's tennis player, Marina spent over a decade inside the world’s top 100 singles and doubles and has competed in 36 Grand Slams. She has been a mainstay in the tennis world since her junior years, during which she won the doubles at both the US and Australian Opens. She has also competed in two Olympic Games and was one of the eight elected player representatives on the Women's Tennis Association Player Council for 4 years. Music: A passionate musician, Marina learned to play guitar and drums while on the road and has, to date produced and released 2 music EP’s under the pseudonym The Mad Era while in various locations around the world. I was privileged to listen to Marina speak in arguably one of the more difficult environments to hold an audience, being a group of primary schools sports awards winners accompanied by their parents. Marina&apos;s ability to pitch and mould her story into an inspiring message to not only the kids but to the parents also was nothing short of incredible. Her ability to engage the audience through humour, experience and questions left the children and parents all lining up to continue the conversation well after the speech concluded. I wouldn&apos;t hesitate in recommending her to speak in front of any audience, whether it be corporate, motivational or a group of kids aiming to achieve extra ordinary things.